Check out the list of top 5 SUVs under 30 lakhs that have high ground clearance. Also know the price, engine & specs of these best ground clearance SUVs. Since 4-5 years, Indian car market seems to be flooded with SUV cars which have made the competition amongst different segments a little tougher. Formerly, SUVs came with heavy price tag limiting themselves for the elite group. But looking at the present scenario many Indian car companies like Mahindra & Mahindra, Renault India, Ford India and Maruti Suzuki have come forward with affordable compact SUVs to give the common people a taste of off-roading. And given how bad the Indian road conditions are, the carmakers are now bringing cars with design specific height and suspension to gobble up those pesky craters and speed breakers with ease. 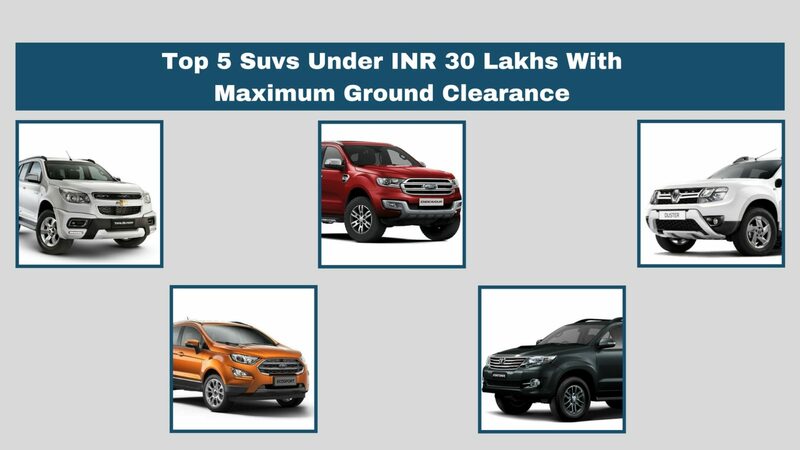 So, let’s take a look at the top 5 SUVs that has maximum ground clearance and that too under INR 30 lakhs price. Chevrolet Trailblazer is the big burly SUV from American car manufacturer that has been jam-packed with some high profile features. The SUV has been tagged at starting price of INR 24.36 lakhs and stands second after Range Rover in terms of ground clearance with 241 mm dimension. 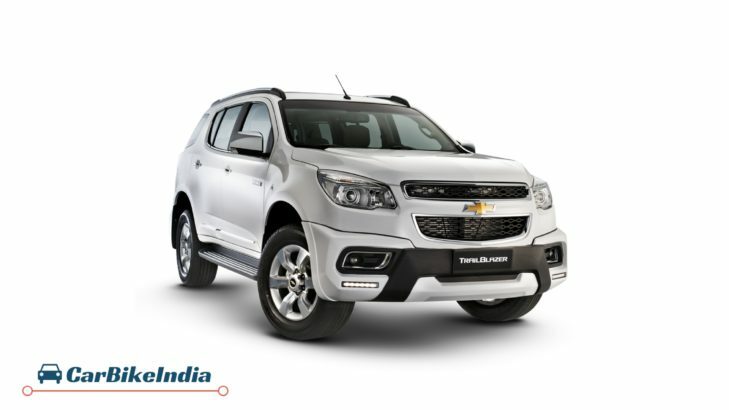 Chevrolet Trailblazer is offered with a 2.8-litre oil burner that returns the power output of 197 bhp and peak torque of 500 Nm. Ford Endeavour has been one of bestselling Sports Utility Vehicle in the country even before common people started becoming aware of the term SUV. Ford reintroduced the new generation Endeavour based on an all-new platform in 2015. The car has priced between INR 25.09 lakh and has the ground clearance of 225 mm. The engine powering the SUV is a 2.2-litre unit that can produce the power of 158 bhp and max torque of 385 Nm. 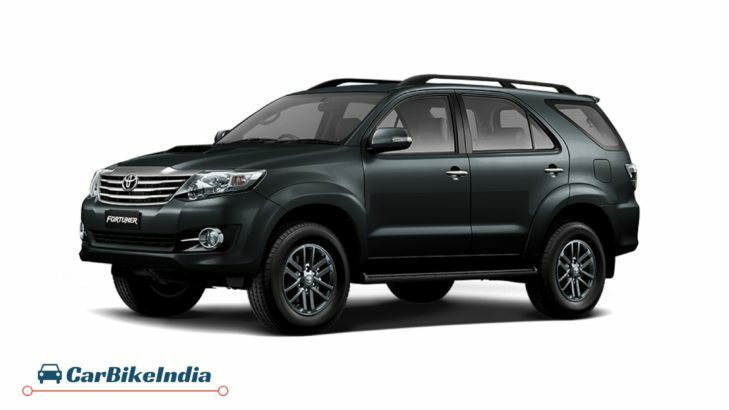 Launched in an immaculate form a year back, the next generation Fortuner has been priced at INR 25.71 lakhs. The sole motto behind the design and engineering of this SUV is to rule the roads. That sheer confidence comes from the 2.7 litre engine that pumps out 163.75 bhp and 245Nm of torque. And with the ground clearance of 220 mm, the SUV can easily sail through most of the troubling roads out there. Renault Duster with its re-launch in 2016 Auto Expo, revived its position in the compact SUV space once again. The car has been priced at INR 8.47 lakh which is well within the reach of every youth craving for an affordable SUV. Engine fitted in the compact SUV is 1.5 liter RXE engine that pumps out 104.5bhp and 142Nm of torque. The ground clearance of the car stands at 210 mm, which is fair enough to deal with most of the road conditions in the country. 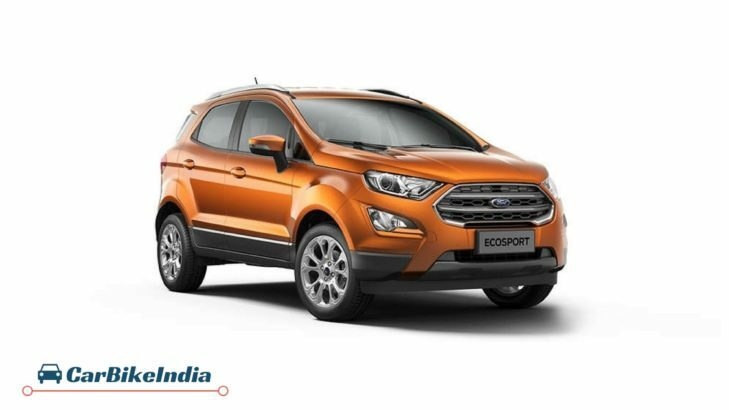 Ford EcoSport has been the bread and butter of the company since many years and has been rejuvenated in the recent times to make it more competitive. Ford EcoSport priced at INR 7.31 lakh has created its own niche in the market with its great all round performance. The car gets new petrol mill is 1.5 liter 3-cylinder unit from dragon series with the power output of 123 bhp and peak torque of 150 Nm. The vehicle riding 200 mm off the ground justifies its SUVs stance. Stay tuned for more articles like this! ← Mahindra Scorpio Facelift Review – Price List, Mileage, Specs, Features, Design, Interior, Images & More!